Almost all of us need fiber supplements. That's because, according to the American Dietetic Association, only a small percent of Americans has enough fiber in their diets. This is why a fiber supplement is a viable option when it comes to meeting that daily fiber intake. It's also important to know that fiber supplements are only great for digestive health. They are actually proven to lower "bad" LDL cholesterol and keep glucose (blood sugar) in check. 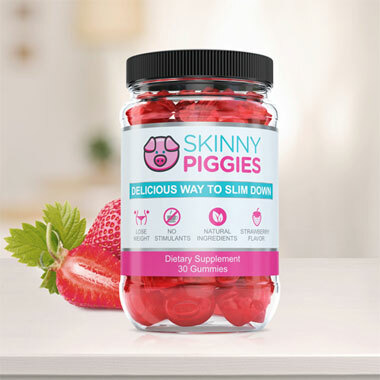 Our product Skinny Piggies gummies are weight-loss fiber supplements that are of tremendous help when you're on a low-carb diet and battling cravings, hunger and want to control your appetite. Skinny Piggies don't contain any stimulants unlike most of weight-loss products. Who Else Want to Lose Weight with These Delicious Gummy Fiber Supplements? Sick of bland and boring diet programs? Do you feel limited when it comes to your food options? You aren't alone. The fact is, most people don't like diet plans. It's certainly not pleasant refraining from foods you like, not fun being hungry, and definitely not fun to exercise when you'd rather chill on the armchair with the latest episode of Gossip Girl. Thankfully, there's an original product that can change that: Skinny Piggies. What is this? Let's give you the facts you must know first. So how does losing weight work? In order to burn more calories than you consume, you need to increase the exercise you get each day or reduce how much you eat. For faster results, the key is doing both. Skinny Piggies help you eat less and reduce your caloric intake which makes achieving effective weight loss easier. Include added regular workout to help accelerate the fat loss process. If only fat loss were that easy! Even though cutting back on your daily calories sounds simple, in practice your strong cravings will probably make you pining for a piece of cake the whole day. That's where Skinny Piggies gummies come in play. These fun, great tasting gummy fiber supplements are produced to not only help you satisfy those cravings but make it easier to stick to your diet program by helping you feel full and satisfied. The science of Skinny Piggies diet gummies is pretty straightforward. Your hunger is caused by 2 key things: the number of calories you consume and the feeling of food in the stomach. After a big meal, your stomach expands from the food pressing on the sides, that makes you feeling satisfied and you stop eating. Ok, so what do you do? Take one Skinny Piggy just 30 minutes before your dinner with a 16-ounce glass of water. Once the Skinny Piggy enters your stomach it will absorb the water and turns into a mushy gel. This gel then uses up space and notifies your brain that you just had a large meal before you even began eating. After 30 minutes you are all set to enjoy your desired meal! Now, the gel is in your stomach and you are full and that can help you eat a much smaller serving and eat a lot fewer calories and still find yourself being full and satisfied. Take a Skinny Piggy and you'll find yourself eating less, stop carb cravings and enable your body to be in weight-loss mode for longer while feeling very full. This way you can combat appetite and hunger, food cravings, and eat much less, without being hungry most of the time. The soft gel also allows the stomach to empty slower and that makes you satisfied much longer. The sooner you feel satisfied, the less likely you are to remain to eat that allows you to accomplish a lower caloric intake. As the liquid gel surrounds the food, it will slow down the absorption of carbohydrates which normalizes your level of glucose in your blood. By steering clear of sudden changes in your blood sugar level you avoid those overwhelming sugar cravings. When you eliminate blood glucose spikes by slowing down the absorption of sugars you are preventing it from being stored as unwanted body fat and that then activates the body to burn its unwanted fat for energy. The slower the intake process the longer you remain in weight-loss mode. There's no limit to the types of fat loss products sold on the internet. From diet supplements to hunger suppressants, it's impossible to find out what diet product is right for you. 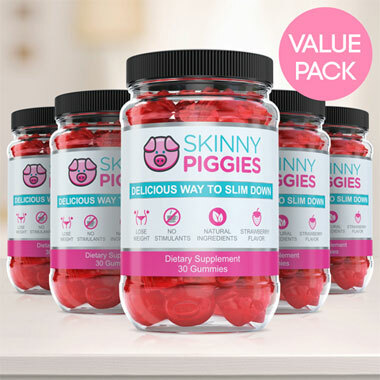 Sifting through the research on each product is a difficult task, but Skinny Piggies are unique for the following reasons. Skinny Piggies contain absolutely no artificial additives - in fact, you can pronounce all of the active ingredients. 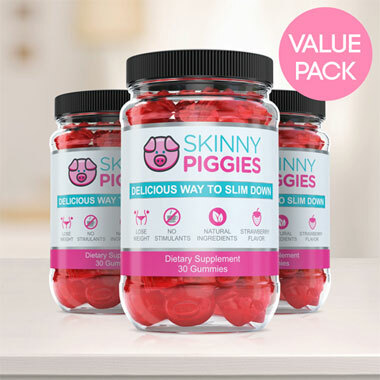 The nourishing, all natural ingredients in Skinny Piggies also have extra health-related benefits such as support for powerful anti-aging properties, healthy looking nails and hair, and healthy looking skin. Skinny Piggies include zero stimulants and no harsh chemicals. No stimulants means no getting tired and you can use it before dinner too. No harsh chemicals means Skinny Piggies are gentle on your stomach. And lastly, what other weight loss supplement is as tasty as a strawberry flavored gummy? 'Thought so! You will love eating these so remembering to take your supplements won't be a hurdle. They're simple to use and anybody can get started right off the bat. 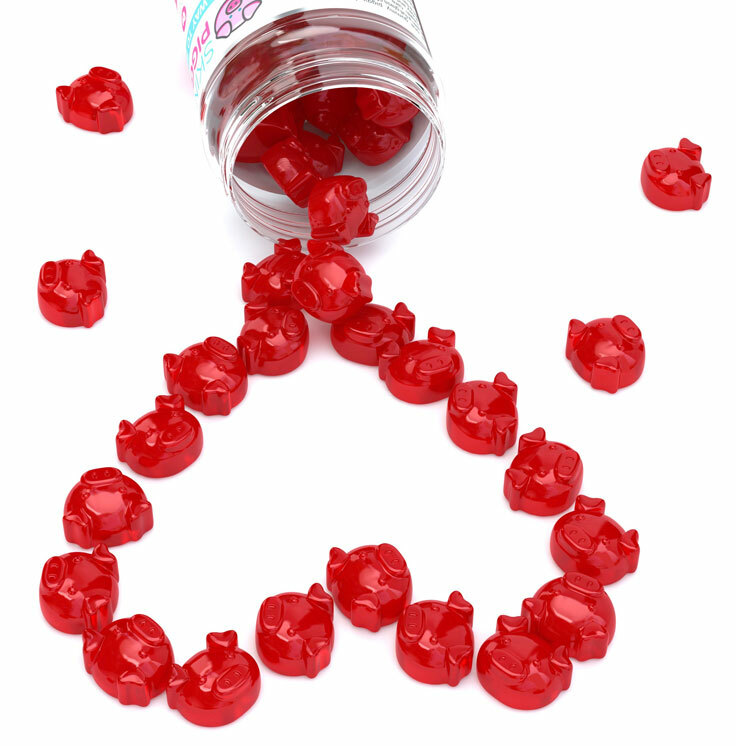 Try one gummy and we're sure they will certainly become a highlight of your day.